● a significant loss in neck movement, usually isolated to one side. For example, difficulty turning head to the left, but not so much to the right. It can just feel like it is stuck. To begin with, the cervical spine makes up the top 7 (C1-C7) vertebrae of our spine. The spine serves as a foundation point for most movement that we make throughout our day. As a result the spine serves as an important part of the “core” that we hear about so often in the health and fitness world. Having a strong “core” is very important to maintaining good musculoskeletal health, and the cervical spine or neck plays just as important of a role as the other parts of our core. So, because the neck is essentially the core for movements related to the upper quarter of our body (from the shoulder blades on up), heavy pushing and pulling activities performed with our arms can put stress on the neck and over time cause pain. Another common contributor to that nasty pain in the neck is the all-too-common desk job with its accompanying poor posture. Having improper posture in a seated position puts the head in a nasty position for gravity to do its work on the spine. It is said that our head weighs as much as an average-sized bowling ball. Imagine the weight of a bowling ball being held out away from your body throughout most of the day, and the fatigue that will certainly set in. This is in essence what the muscles and joints of the neck have to do throughout the day if posture is poor while we sit. What do we do about mechanical neck pain? Keep in mind the old adage from Benjamin Franklin, “An ounce of prevention is worth a pound of cure”. Most of these nagging neck pains can be avoided altogether by watching our posture throughout the day and making sure our postural muscles have good strength and endurance. Maintaining good flexibility throughout our neck and upper back is also important through a regular stretching routine. In the early stages of neck pain, it is important to keep the neck moving. It will actually slow your recovery if you over protect your neck and don’t move it enough. Recovery will speed up with early gentle movement exercises. 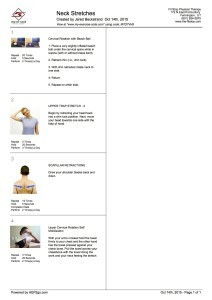 See the following home exercise program for your neck pain. As always, we use the website hep2go.com to generate all of our home exercise programs for our patients. Click on the image below to open up a PDF in a new browser tab/window. If you do have neck pain or any questions about pain related to the neck and upper shoulders please don’t hesitate to call us! We would love to hear from you and answer whatever questions you may have!